Over the last few weeks I have been going over in my mind the reasons why I should support the national team at this years World Cup. This statement may surprise a number of my readers as I have tended to be very patriotic in the past. Over the last year or so however, such stanch support for my country of birth has been slipping away. Whilst I am still proud to be English, it seems harder to reason why. In a celebrity driven, politicised, segregated, money driven and resource dependent culture, it’s hard sometimes to be comfortable with being English. Given these concerns, it annoys me that when ever England are involved in a major football tournament, I feel as though I’m being sold ‘being English’. ‘England’ feels very much like brand these days, banded about by the Sun newspaper, with the merchandise being flags flown from everybody’s cars, alongside the predictable reports on Midlands Today about England football kits for you dog, or the latest craze in fridge magnets. I can’t help getting the feeling that the majority of people in this country are patriotic because The Sun said they should be. And nothing says England like the St. George’s cross—with ENGLAND spelt out across it. In case it wasn’t immediately obvious by the red cross on a white ground I guess. You know, I find it ironic that people drive around with these flags flying from the back window of their Renaults, BMW’s or Toyotas etc. To me this seems a little hypocritical given that one of the major causes of the death of MG Rover (and those companies that went before it) was that very few people in this country actually brought our own car brands. Of course, the fact that half of the workforce was constantly on strike wasn’t helpful either. Around this time of year, we also have to contend with an endless stream of nobodies that suddenly feel they are able to reach the top of the music charts. Seemingly rewording a vaguely familiar song by injecting the words ‘world’, feet’ and ‘England’, and listing famous English footballers is a recipe for success. If putting up with the consumerism of your own national identity wasn’t enough to contend with. So, putting aside the fact that, realistically (and even statistically and historically), England will exit the tournament with one lucky player getting signed up to do an advert for Pizza Hut (no doubt alongside Stuart Pearce and Gareth Southgate), why exactly should I support England? Because I was born here? Maybe so, but I was also born in Epsom, but that doesn’t mean I like horse racing. Because I support the players? Maybe—if they supported more than their own bank balances and stopped complaining ‘that their career will end in their thirties, and so £70,000 a week is compensation’ (as is often the case put forward by the PFA). I’m willing to support the players as long as I’m convinced they are playing for this country, not for their own personal gain. Because it will encourage this nations growing number of obese children to go out and play football? Yes. On the industrial units, housing estates and retail parks that replaced the playing fields they were built on. You’ve got to do it on your own terms. And that I am. Of course in the last few days, World Cup fever has started to bite. I’m a big fan of the World Cup given it’s spectacle, and the fantastic football matches it produces. I guess I also enjoy (in a suicidal sort of way) the emotional roller-coaster that is supporting England in a major football championship. So much about being English is living in the past—be it 1966 or 1945. As during the Rugby World Cup in 2003, I want to be able to say I watched England win the World Cup. I want to see England win, because it will prove to everyone… or perhaps just me, that sometimes, this country can sometimes get it right. Having said that, if we do win, we’ve just sacked the guy who got us there. 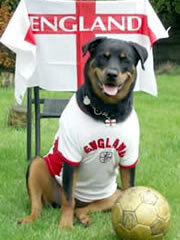 The appointment of Fabio Capello has brought about a more stylish and confident England. Now they have a kit to match.